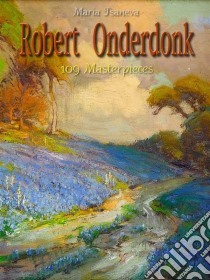 Robert Jenkins Onderdonk (1852 – 1917) was an American painter and art teacher, born in Catonsville, Maryland. An important artist in the first stage of Texas art, he was a long-time art teacher in San Antonio and Dallas, where he formed art associations and leagues; for his contributions to the culture of art and painting in Texas he is known as the "Dean of Texas's Artists." Onderdonk's masterpiece, the 1903 painting Fall of the Alamo, was displayed at the 1904 Louisiana Purchase Exposition in St. Louis, and is now held in the Texas State Archives. Occupying central position in the painting is Davy Crockett, a depiction reproduced countless times in print; Crockett is portrayed in iconic style, "swinging his flintlock over his head to club the Mexicans advancing through a hanging cloud of gun smoke." According to Fisk's A History of Texas Artists, he would have been ranked one of America's finest artists if he had spent more time painting rather than teaching.